*It is not actually confirmed to be a debacle, however since there are only 35 knitting days left until Christmas, and I have only knit this much? It's not looking good. In October(!) I thought, "Gee, I've been having so much fun knitting Christmas stuff, I should do more- I know! I'll knit Dad a sweater for Christmas!" So I enlisted spies (my mom) to ascertain the desired color and obtain measurements, found a pattern** and ordered yarn. 1. The trip to Hawaii- where I was spending approximately 30 hours in airports or on planes- generally prime knitting time. My original plan said I would knit 30-50% of the sweater while on this trip. 2. I'm a fast knitter. I've turned out baby blankets in about six weeks, which had roughly the surface area of a sweater, and were in a smaller gauge (had more stitches per inch). I've been doing a pair of socks every two weeks- not as big, but they're in fine yarn with lots of stitches. The sweater is thick yarn plus large needles = fast knitting. 3. The free-form pattern I'm using is designed to be knit in one piece (reducing finishing) and for the size to be adjusted as you go (meaning you should never get to the point of discovering the sweater will fit Tiny Tim or the Incredible Hulk, but not any living person of your aquaintance, never mind the recipient of the gift). 4. My database class is taught by a professor with the remarkable ability to talk for two hours without breathing, drinking water, or apparently noticing that his subject material would stupify the most enthusiastic computer geek. (There are topics that will keep me alert and interested for two hours of lecture- relational algebra, entity-relationship diagrams, and transactional concurrency are not them.) Knitting is a necessity. So why not whittle away at my Christmas list at the same time? 2. Though I had the yarn a week before the trip, the pre-vacation crunch meant that I only had time to swatch (knit various sample blocks) to determine what size needles I wanted to use. I had a free-form pattern, but I hadn't yet designed the sweater**! (The original plan said that I would have a sweater all designed and on the trip I would Just Knit, but I ran out of time.) And while knitting is great for being able to pick it up for a few minutes here and there? Design is not. Many evenings I got in from sightseeing, glanced at the pattern, read half a page of a book instead and fell asleep. 3. I habitually underestimate the amount of work in a project and totally overestimate my own ability to cope, resulting in deadline crunches. The free-form pattern is basically a general formula for a top-down sweater with a raglan sleeve. I found it on the internet as a worksheet, where you figure out what your gauge is (number of stitches per inch), you measure (or have an accomplice measure) the recipient of the sweater, and then start knitting. Which would work fine if I were doing a (mostly) plain unpatterned sweater. I'm not. My dad loves cable-knits, and once, many years ago, I knit him a cabled cardigan*** which he passionately loved and wore constantly until it fell apart (my dad is a discerning and enthusiastic recipient of hand-knit items- it's very gratifying). (I don't have a picture, but it's similar to this one, which I made for a friend.) Several years ago, my mom mentioned that he'd really like another, but I was busy on a quilt, and deferred the request. Until now. So I wanted to knit the basic sweater pattern but with some modifications- make it a cardigan with a V-neck (like the old one) and with a new cabled pattern of my own devising. A top down sweater is cast on at the neck, increases in size rapidly (by adding stitches) to fit over the shoulders. Then the front and back are joined (leaving the sleeves stitches to be picked up and knit in the round (in a spiral) down the arms). You knit each sleeve separately, and then knit down the body. This has several advantages- it puts all the tricky fitting at the beginning, so you don't get well into the sweater and discover size problems. It also allows you to fit as you go (if you get to the right size before you finish increasing, you stop- if you reach the end of the planned increases and it isn't big enough, you go on). My dad's only four inches taller than I am (I'm tall) and I know from previous sizing exercises that a sweater that fits me loosely with an extra 3-4 inches in the sleeve will be a good fit for him. Seems fairly simple, right? Wrong. It's the damned cables. All the increases between neck and shoulder? Have to be done in pattern. That means I can't just add a stitch- it has to be the right one, to be part of the pattern that will be *below* it on the sweater (when it's longer). And it's not like I'm adapting a pattern I already had lying around (where I could have penciled in some additions). No, I'm picking a bunch of different cable designs I think will look good together, arranging them to suit myself (and the sweater) and trying to add *those*. Then, keep in mind, I love symmetry, and nearly always when knitting cables I'll try to make the left and right be mirror images. 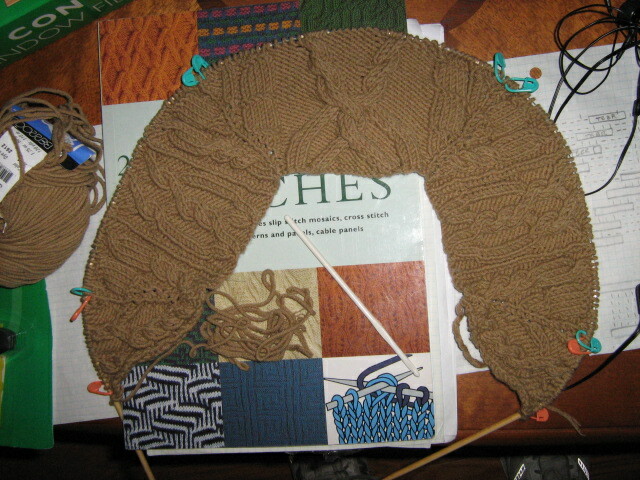 So in half the sweater I'm also flipping the instructions right to left to get the cables to mirror each other. Not surprisingly, this all turned out to be *way more* than I could do in my head. WAY MORE. So I spent most of the trip designing. Picking cables. Charting them in order and marking the increase lines so I could see what I needed to do for each set of increases. Making some minor changes to the pattern to help me keep track of what I was doing. I only started knitting at the end of the last flight home (jetlagged, underslept, and all). I did most of what you see in the picture over the weekend while listening to the last two weeks of database lectures. I do have a backup plan, which I may**** have to resort to- his birthday is in April. I could just find him a nice book or something for Christmas. But I really hate abandoning a plan. Which means I'll be doing a certain amount of frenzied knitting before (possibly) admitting defeat. 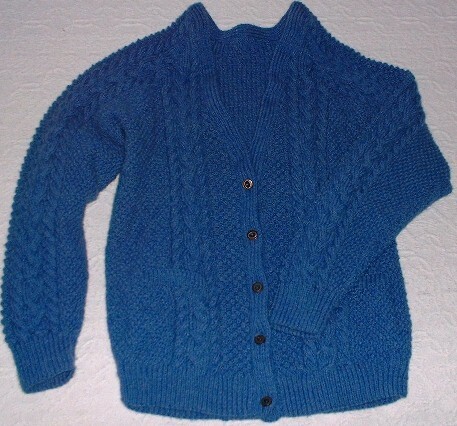 ***Now that I think about it, the original cardigan was finished at 4 am Christmas morning. This was 15 years ago. Evidently, I have not learned anything. If you come up with any good explanations, please let me know...I'll be over here explaining to the men in white coats that it will all be fine if they'll just let me keep my knitting.